When it comes to cleaning rugs in Auckland, our team of specialist technicians are on hand to offer expert advice and cost effective methods to leave your treasured rug looking like new again regardless of the size, texture, pattern or type of rug that it might be. We have over 2 decades worth of experience in dealing with rug cleaning Auckland and rug repair. Specialist rugs whether handmade, woollen blend or antique require a specialist level of care and attention, especially if they are old, worn out or delicate fabrics. Our team will collect your rug and take it off site where it can be properly cleaned with care, paying special attention to detail, allowing natural drying time and to avoid any damage that may be caused by conventional cleaning methods. Rugs attract dirt and dust and over time, they become worn looking and tired with faded colour, fraying and damage which can ruin their appearance. 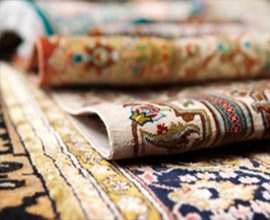 Our rug technicians will work quickly to provide a level of service that is second to none. We pay special attention to detail on intricate rugs, delicate and antique rugs and use very unquiet shampoo and chemicals to avoid any damage to your rug, regardless of the age or condition. For rug cleaning in Auckland, the process is slightly different from your average carpet, mainly due to the fact that some rugs are thinner and more delicate. Firstly, we hang the rug and beat the dust and surface dirt from it using a light bush. We then use a strong vacuumed to get rid of remaining dust and dirt which may be embedded deep into the pile and brush a specialist cleaning shampoo onto the rug paying attention to any intricate detail and end tassels which is a process usually done by hand and not using any harsh machinery. The shampoo will release any stubborn stains or spot and will start to revive vibrant discolouration. Once dry, this is vacuumed and then process repeated as many times as necessary to fully revive the original condition of the rug. Allowing the rug to dry naturally during this process is key to avoiding any damage to your rug. Finally, the rug is brushed once again to help revive the pile, leaving a fresh, new looking result every time. Our Rug cleaners Auckland tackle any job, no matter what the size, condition, fabric type or age of the rug involved. The time taken depends largely on the condition of the rug and the attention to detail needed. We are specialists in all types of rug from Persian, natural, wool or antique and strive for perfection every time. Give us a call today to discuss your requirements in full on 09 950 7177.